Preheat the oven to 160˚C and rub duck legs with salt. Heat a cast-iron pan over high heat. 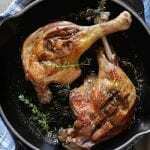 Place duck legs, skin side down, in the pan and sear for 1 minute, then turn and sear the other side. Remove duck from pan.